"Rocketplane" redirects here. For the company, see Rocketplane Global Inc.
A rocket-powered aircraft or rocket plane is an aircraft that uses a rocket engine for propulsion, sometimes in addition to airbreathing jet engines. Rocket planes can achieve much higher speeds than similarly sized jet aircraft, but typically for at most a few minutes of powered operation, followed by a glide. Unhindered by the need for oxygen from the atmosphere, they are suitable for very high-altitude flight. They are also capable of delivering much higher acceleration and shorter takeoffs. Rockets have been used simply to assist the main propulsion in the form of jet assisted take off (JATO) also known as rocket assisted take off (RATO or RATOG). Not all rocket planes are of the conventional takeoff like "normal" aircraft. Some types have been air-launched from another plane, while other types have taken off vertically – nose in the air and tail to the ground ("tail-sitters"). Because of the heavy propellant use and the various practical difficulties of operating rockets, the majority of rocket planes have been built for experimental use, as interceptor fighters and space aircraft. Rocket-powered flight was pioneered in Germany. The first aircraft to fly under rocket power was the Lippisch Ente, in 1928. The Ente had previously been flown as a glider. The next year, in 1929, the Opel RAK.1 became the first purpose-built rocket plane to fly. The first rocket plane ever to be mass-produced was the Messerschmitt Me 163 interceptor in 1944, one of several German World War II attempts at rocket-powered aircraft. The Bachem Ba 349 "Natter" vertical takeoff manned rocket interceptor aircraft flew in prototype form. Projects which never even reached the prototype stage include the Zeppelin Rammer, the Fliegende Panzerfaust and the Focke-Wulf Volksjäger. The Japanese also produced approximately 850 Yokosuka MXY7 Ohka rocket-powered suicide attack aircraft in World War II. Other experimental aircraft included the Russian Bereznyak-Isayev BI-1 that flew in 1942 while the Northrop XP-79 was originally planned with rocket engines but switched to jet engines for its first and only flight in 1945. A rocket assisted P-51D Mustang was developed by North American Aviation that could attain 515 mph. The engine ran on fumaric acid and aniline which was stored in two 75 gallon under wing drop tanks. The plane was tested in flight in April 1945. The rocket engine could run for about a minute. In 1946, the Soviet Mikoyan-Gurevich I-270 was built partly using technology developed by Sergei Korolev in 1943 and 1932. In 1947 the rocket-powered Bell X-1 was the first aircraft to break the speed of sound in level flight and the first of a series of NACA/NASA rocket-powered aircraft. The North American X-15 and X-15A2 designs were used for around a decade and eventually reached Mach 6.7 and over 100 km in altitude. In the 1950s the British developed mixed power designs to cover the performance gap that existed in then-current turbojet designs. The rocket was the main engine for delivering the speed and height required for high speed interception of high level bombers and the turbojet gave increased fuel economy in other parts of flight, most notably to make sure the aircraft was able to make a powered landing rather than risking an unpredictable gliding return. The Saunders-Roe SR.53 was a successful design and was due to be developed into production when economics forced curtailment of most British aircraft programmes in the late 1950s. The advancement of the turbojet engine output, the advent of missiles, and advances in radar had made a return to mixed power unnecessary. The development of Soviet rockets and satellites was the driving force behind the development of NASA's space program. In the early 1960s, American research into the Boeing X-20 Dyna-Soar spaceplane was cancelled due to lack of purpose; later the studies contributed to the Space Shuttle, which in turn motivated the Russian Buran. Another similar program was ISINGLASS which was to be a rocket plane launched from a Boeing B-52 Stratofortress carrier, which was intended to achieve Mach 22, but this was never funded. ISINGLASS was intended to overfly the USSR. No images of the vehicle configuration have been released. The Lunar Landing Research Vehicle was a mixed powered vehicle- a jet engine cancelled 5/6 of the force due to gravity, and the rocket power was able to simulate the Apollo lunar lander. 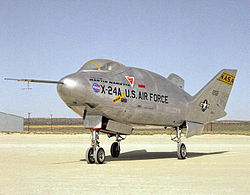 Various versions of the Reaction Motors XLR11 rocket engine powered the X-1 and X-15, but also the Martin Marietta X-24A, Martin Marietta X-24B, Northrop HL-10, Northrop M2-F2, Northrop M2-F3, and the Republic XF-91 Thunderceptor, either has a primary or axillary engine. The Northrop HL-10, Northrop M2-F2 and Northrop M2-F3 were examples of a lifting body which are aircraft which have very little if any wing and simply obtain lift from the body of the vehicle. Another example is backslider rockets in amateur rocketry. The EZ-Rocket research and test airplane was first flown in 2001. EZ-Rocket was the first privately built and flown rocket-powered airplane. A second privately developed rocket-powered aircraft flew just two years later, in 2003. SpaceShipOne functions both as a rocket-powered aircraft—with wings and aerodynamic control surfaces—as well as a spaceplane—with RCS thrusters for control in the vacuum of space. The Rocket Racing League has developed three rocket racer aircraft since 2001, after initially evaluating and testing the EZ-Rocket in 2001. None are currently in production however. ^ "Lippisch Ente. "[permanent dead link] The Internet Encyclopedia of Science: Experimental Aircraft. Retrieved: 26 September 2011. ^ "The Messerschmitt Me-163 Komet." Archived 2016-07-20 at the Wayback Machine plane-crazy.net. Retrieved: 26 September 2011. ^ Bille and Lishock 2004, p. 9. ^ "Bell X-1." allstar.fiu.edu. Retrieved: 26 September 2011. ^ "North American X-15 High-Speed Research Aircraft." Aerospaceweb.org, 24 November 2008. ^ Day, Dwayne. "A bat outta Hell: the ISINGLASS Mach 22 follow-on to OXCART." The Space Review, 12 April 2010. Retrieved: 26 September 2011. ^ Matranga, Gene J., C. Wayne Ottinger and Calvin R. Jarvis with C. Christian Gelzer. "Aerospace History #35 NASA SP-2004-4535: Unconventional, Contrary, and Ugly: The Lunar Landing Research Vehicle." NASA, 2005. ^ Knapp, Alex (2014-06-18). "Bootstrapping To The Stars". Forbes. Retrieved 2014-06-19. Bille, Matt and Erika Lishock. The First Space Race: Launching the World's First Satellites. College Station, Texas: Texas A&M University Press, 2004. ISBN 978-1-58544-374-1. Wikimedia Commons has media related to Aircraft with rocket engines. This page was last edited on 23 March 2019, at 21:05 (UTC).